Kingdom Come: Deliverance is an open-world game set in 15th century Bohemia (present day Czech Republic), and was marketed with a significant focus on its historical accuracy. 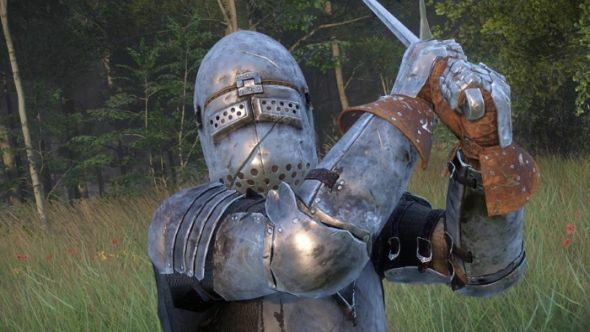 As it turns out, however, Kingdom Come: Deliverance might not actually be all that accurate – one Redditor claims that the developers got the armour wrong. Pray your armour holds out, or get ahead with our Kingdom Come: Deliverance combat guide. One example of the inaccuracy focuses on a breastplate. According to MRPolo13, it’s estimated to have been updated in around 1410, while the game itself take places in 1403. The plate is also Italian, meaning it’s possible, but quite unlikely, that it’d be worn by someone living in Bohemia, which is not only a long way from Italy, but prefered its German-style armour. The plate is also very slightly the wrong shape – the bulging shape of 14th and 15th century armour is apparently far more pronounced than in many reproductions. There are plenty of other examples, focusing on everything from gauntlets to chainmail, but my personal highlights stem from the analysis of the helmets. A comparison of a helmet housed in the Polish Army Museum and those in game suggest some pretty glaring inaccuracies, from eyeslits that are too big, to a helmet that MRPolo13 claims he has never seen any example of, largely because it would have caused immediate murder by pollaxe if it was ever used in combat. You can check out the post (which is apparently far from an exhaustive list) in its entirety on Reddit. I’ve reached out to Warhorse for comment, and to MRPolo13 for more information.